Buying Bieber—Just Gotta Have It! or Just a Joke? Justin just launched his new perfume for women, Someday. It comes in a crystal bottle with a little rose on top, adorable! The jury’s out on how good it actually smells, but we’ll soon find out when Bieber fans take to the street wearing the new scent. The ad promises that you’ll smell so good that Bieber will want to [kwlink 25230]fly away with you[/kwlink] (literally!) Take a look at the new ad below. These Bieber’s Girl Lounge Shorts (available on JB’s website) let everyone know whose team your on, JB is in block letters on the front like a school logo—but we all know that Bieber’s girl is actually actress/singer Selena Gomez. Still, if you want to live the fantasy (in comfort no less!) these are also available on The Biebz’s site. You can have your very own Bieber to love and hold, but he’s only as big as your hand! 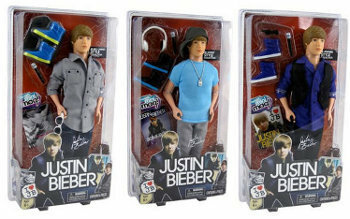 The Bieber doll collection comes with a variety of outfits and accessories, but the resemblance to the actual Bieber? We’re not so sure…maybe they should leave the reproductions to the wax museum! Before you fell in love with The Biebz, most of us fell in love with the music, and Justin’s brand name microphone lets you karaoke along to some of your favorite Bieber hits—but only for 30 seconds at a time! Maybe it’s for the best, not everyone sounds as good as he does. The life-size cut-out is for serious fans alone. Available online for $35, we think that this little item really pushes the limit of your love for JB. You can prop him up in your room, hide him under the bed or in a closet, but in terms of actually being useful…we’re just not sure. It’s up to you Bieber fans! 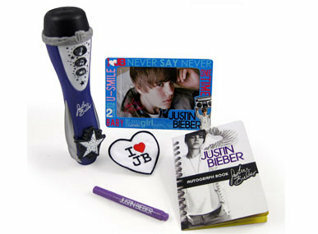 What are some of your fave items that show your love for The Biebz and has the Bieber buying craze gone too far? Tell us about it, leave a comment below! Justin Bieber's Buddy: His Director Jon Chu! No way, he's so annoying! I like his music, but I'm sick of him!